Once only for the rich and famous, a home elevator is now an affordable luxury to make the home barrier free and convenient. Building a new home with a residential elevator can add value to the property by making it accessible to all and ease every day tasks like lugging laundry and groceries between floors. Here’s some great information. A private home elevator is a specialized version of a public elevator, with the same basic principle of operation. In North America, residential elevators should be built to meet certain code requirements that limit such things as the speed, size and capacity for home use only. Most home elevators require a shaftway in which to travel. Modern designs feature automatic operation so they open, close and move and down with single touch buttons. Today’s home elevators can be finished inside to match the homeowner’s style and design tastes including solid hardwood interiors and glass observation panels. A locally trained residential elevator contractor will perform a site visit to assess the space you have and the specific construction requirements in your home. The best time to involve the contractor is when you are planning a new home, or planning a major renovation. Not all home elevators have the same requirements, so it is imperative to select the elevator you want before the hoistway is constructed. The best companies have free planning guides on their web sites to advise on hoistway construction. Your elevator will be custom built and programmed to travel from floor to floor with 2 stops or more. Each landing will have a call station button (hall call) installed and each landing will also require a special door that locks and cannot be opened unless the elevator is at the landing. The elevator itself should also have a cab door or gate to keep occupants from falling outside the cab while the elevator is in motion. Inside, the elevator will include a cab operating panel (COP) to allow the user to select the stop and operate doors. For traditional elevator drive systems, the inside elevator cab can be finished as you like it. Some companies offer great factory finish options including solid raised hardwood, veneer, MDF, melamine or plastic laminate walls. You many also choose to receive a basic unfinished cab and have your local home contractor to finish the cab to match you home. The elevator will also have hardware fixtures such as a handrail, operating panel and pot lighting in the ceiling. You will be able to select styles and finishes for these components. A home elevator cab is built to a variety of standard sizes or may be custom-sized. A good size is 40″ by 54″ (a maximum size is 15 sq. ft in North America). A home elevator can have one or two doors that exit straight through or at 90 degrees to each other depending on your home construction. You may also have a choice for the height of your elevator cab. A taller cab (80″) will feel more spacious. A home elevator cannot be installed in any kind of public building, including places of worship. For any buildings that are not private homes, you will need a commercial elevator or lift. The exception is a private condominium with private access. Hoistway contruction is important. Do not build a hoistway without knowing the specifications required for your elevator. An elevator also needs overhead room (room above the top of the elevator at the top landing), and usually a pit at the bottom. A general idea of space required for the hoistway would be five square feet. Leading manufacturers publish many specifications on their web sites to plan in advance. A hoistway has a number of requirements for construction including specifics for the wall where the elevator rails will be secured (the support wall). Each manufacturer provides these specifics for the model of elevator. Most of the time, a pit between 6 and 12 inches is required at the bottom of the hoistway. The pit must have a concrete pad able to withstand an impact load for safety. There are also electrical requirements for residential elevators that vary by model. 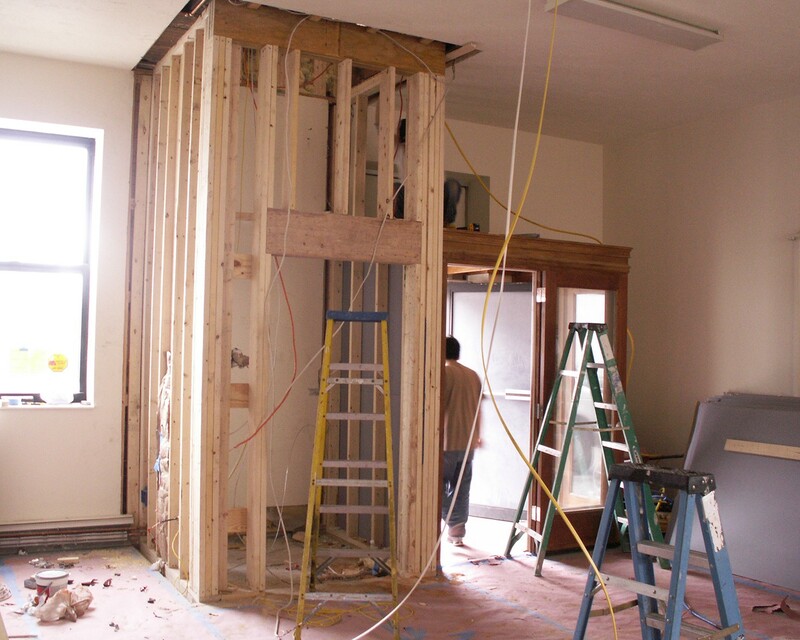 A skilled electrician will need to ready the site to power the drive and other features of the elevator such as lighting. Most elevators include a phone key pad for safety, but you will need to add a landline for the telephone capability. Residential elevators can travel up to 50 ft depending on the model and manufacturer and move at a speed of between 20 and 40 feet per minute. Each model has its own capacity rating but the largest size carries 1000 lb (some areas may allow larger capacity). Doors and gates are controlled with electro mechanical locks for safety. Solid core doors are required. A door operator can be added so that it does not need to be opened manually. Automatic sliding doors like those from Savaria provide added safety because they eliminate the gap between the landing door and the cab door. Look for doors and gates that include light screens or light curtains. Light screens create a beam of light that when broken by a person walking through it, ensures that the elevator cannot move. Your local professional elevator contractor should know the local code and inspection requirements for residential elevators. You may need a permit and you may also require government inspection before you can use your elevator depending upon where you live. Silver Cross can help you find a pre-qualified installer near you who will know what is required in your area. There are several different drive systems available for home elevators. Each has its advantages and disadvantages. A popular choice that is moderately priced. The geared traction home elevator uses a chain with motor and counterweights to move the elevator up and down. It is generally regarded as a good quality ride, low maintenance and not difficult to install (by a professionally trained elevator contractor). This option (on a geared traction drive) means that a separate machine room is not required for the elevator drive system. Instead, the drive is integrated with the elevator itself. This means less space is needed for the installation. An ideal choice when you do not have space near by for a dedicated machine room. The elevator moves using power generated by moving pressurized hydraulic fluid through a cylinder. Known as a very quiet and smooth ride in comparison to a chain drive elevator. Typically, more expensive than chain drives and more complex to install with a machine room required to house the drive system. Today’s commercial elevators are fast, smooth and quiet thanks to gearless traction systems. Because of their more complex drive systems, they are more expensive but gearless home elevators offer the smoothest, quietest rides. A machine room is not required. They are the ultimate home elevators. Less popular today, a winding drum elevator is less expensive with its simple technology of winding cable from years past. They tend to be more noisy and less smooth than most people want. A very small cab size may be possible with this type of drive. These futuristic looking elevators use air suction to move an elevator car up and down inside a plastic cylinder (just like mail moves through pneumatic tubes in large offices). They are quiet and smooth, but quite expensive. These elevators are not fully automatic, they feature constant pressure operation. They operate on a self-supporting tower and move through a floor cut-out rather than a hoistway. When space is an issue, this option is a good way to move one person with a wheelchair from one floor to another. A well built home elevator should last many years with scheduled maintenance. Choose a well known manufacturer with history in the business. A home elevator is nothing you should go cheap on. Do your homework to buy quality and it will last. Installing a residential elevator is for the pros only. Licensed, experienced elevator technicians will ensure that your elevator meets all national and local code which is critical for safe operation. Silver Cross has a list of pre-qualified elevator installers and can help you find a local expert. The elevator drive system you choose will dictate the noise and smoothness of the ride. The quietest and smoothest rides come from gearless drives or hydraulic drives. But there are pros and cons to each style, so it’s always best to visit a dealer’s showroom to try the elevator type yourself and ask questions. Some companies are very flexible and offer different finish options and cab styles. Adding options such as glass sliding doors (offered by Savaria) takes your home elevator to a different level of luxury altogether. Before you run down the path of picking exactly what you want, a local elevator contractor is the right person to help you review your needs for travel distance and hoistway requirements and these factors may narrow your choices. If you are building a new home, figure the elevator into your plan right from the beginning for the most flexibility of choice. For a renovation, make sure you get an expert in to review how it can be done. A home elevator costs between about $20,000 and $50,000 including the installation. Entry level elevators have 2 stops and basic interior finishes. More expensive home elevators have luxury finishes and more stops. Adding things like glass walls and doors may raise the price about $50,000. The actual elevator installation time will likely be 1 week. But that time does not include the building of the hoistway and on-site finishing time for things like flooring. How much space does a residential elevator need? Allow at least 5 square feet for a hoistway. You will also need to allow for space above the top landing (overhead) and below the bottom landing (pit). How safe is a home elevator? Installing a reputable manufacturer’s elevator using a licensed local elevator installer ensures the best level of safety. There are very specific rules and code requirements for installation that should be followed. Home elevators need to be operated according to the owner’s manual. What is the largest size of home elevator? 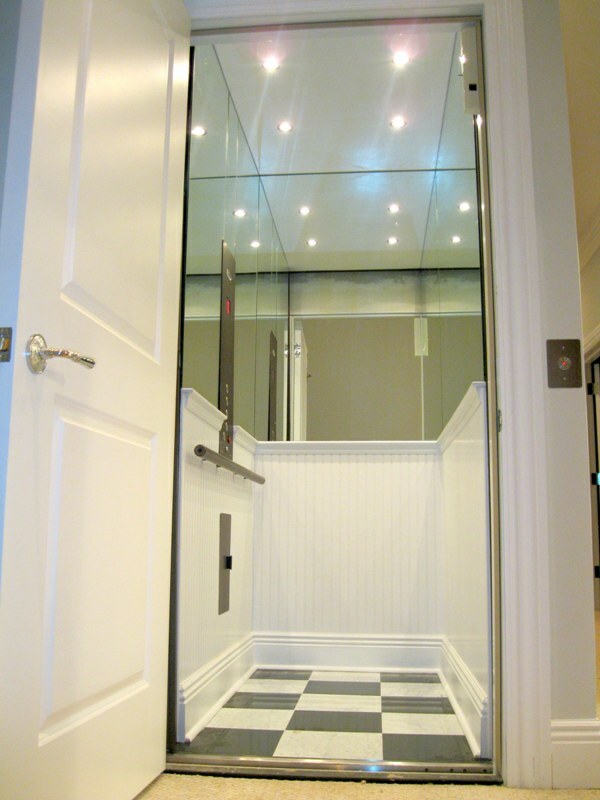 A home elevator by building code, can be a maximum of 15 square feet inside the elevator cab. What type of maintenance is required for a residential elevator? Each manufacturer specifies maintenance requirements or schedules. Just like a car, you will need to service your elevator according to the schedule in order to uphold the warranty and avoid larger, more costly repairs. Who are the top manufacturers of home elevators in the US and Canada? Inclinator, Savaria (Concord) and Waupaca are all well known, established names in the business. What is the best type of elevator drive system? All systems have their pros and cons. Gearless and hydraulic drive systems are usually the quietest and smoothest running, but geared traction drives are easier to install and can be less expensive to install as well. What is a through-the-floor elevator? A through-the-floor elevator is a specialty home elevator that can travel with 2 stops. Rather than being installed into a shaftway/hoistway, it travels through a cut-out in the floor, on a tower which is securely mounted to the wall. The cut-out features a cover that rides on the top of the elevator and goes back into place on the floor when the elevator is at the bottom so the floor hole is covered. There are several residential elevator companies based in North America. With the exception of Savaria which is a public company, the companies are privately held. Commercial elevator companies such as Otis and Kone do not sell home elevators. A family-run business of 90 years, Inclinator’s Elevette home elevator was actually introduced in 1928. Today, the company offers cable drum and hydraulic drive elevators as well as machine roomless options. An overall accessibility company, Savaria purchased luxury manufacturer Concord Elevator in 2005 and offers hydraulic, machine roomless geared traction and gearless home elevators. They are known for doing custom work to meet virtually any needs. In business since the 1950’s, this well known company makes winding drum and hydraulic units with machine roomless options. With its roots in mountain aerial tramways, Garaventa changed its focus to accessibility products in the late 1970’s. The company more recently introduced home elevators to its portfolio with a hydraulic and machine roomless model. This company offers both traction and hydraulic drive systems. They are more well known in the southern US. If you are considering a residential elevator, take your time with this decision. Contact several local dealer/installers to arrange for an in-home analysis and estimate. Make sure you ask plenty of questions, and get any estimates and guarantees in writing. I had a neighbor growing up who had an elevator in their house. Now that I’m older and have the financial means, I want to install a residential elevator in my house. I had no idea that there were so many types of elevators. I think I’ll talk to the contractor about which would be best for my house. Thanks. Thanks for your comment, Annie. Let me know how your investigation goes! We bought a condo in an old mill building, well actually we bought “condo space” with responsibility ( and oversight) to improve/rehab space into condo. Out floor space , quite large and a per sq ft bargain, included an old original but still functioning industrial elevator. They were quite unique : they “came up through the floor” literally by a rounded hoop which curved over the open top platform and pushed through the floor above. The “floor” it pushed through was actually two in effect trap doors that clamshell opened and closed once the elevator had cleared the doors. It was quite a Rube Goldberg appearing operation – but – it was simple, and, it worked. Over and over. It was made ( except for metal hoop) entirely out of beautiful aged solid oak. The realtor went to great pains to point out we would have to hire a contractor to remove it and suggested getting estimates. The elevator went down to the ground level space which was to become our garage. Why take it out ? So now we have this charming solid oak elevator – for free.